Föreningen Ekonomerna, the Business Association at Stockholm Business School, is a non-profit, politically impartial association placed under the Faculty of Social Sciences at Stockholm University. The Association was founded in 1965 and has, today, about 1300 members. We strive to increase the benefits for our students by raising questions about education, providing social activities and creating an inspiring place to meet based on dedication and the wish to make valuable contacts for the future. The Association is made up by a number of committees, clubs and projects who with their different orientations and responsibilities offers a wide spectrum of activities that make Föreningen Ekonomerna a necessity for business students with style. Examples of what keeps us busy are: networking, marketing, social events, stock trading, educational issues and international relations. We hang out in Festningen, house 1 in Kräftriket. All students at Stockholm University are welcome to join Föreningen Ekonomerna and all of our members are most welcome to engage in student activities here. Both in pre-existing committees and projects or by creating new ones and thereby increase the return on their student life. We continuously work with our external relations, both with our corporate partners and with other student associations and universities and is a part of the student network U9. You can find us at Kräftriket House 1, Festningen. The bus stop is called Albano, and you are always welcome to mingle and have some coffee. We have plenty! Are you interested in getting involved with the Association? Send an email board@foreningenekonomerna.se and we will help you to find a place in Föreningen Ekonomerna. 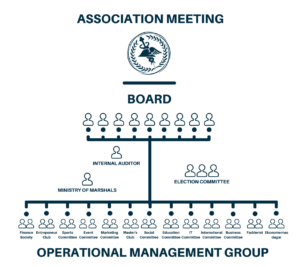 The internal auditor is responsible for reviewing that the board of the association follows the associations’ constitutional rules – the statutes, the job descriptions, the policies, and other decisions made by the association meeting. The internal auditor shall also be available when the board or any other member of the association has questions regarding formalities or the constitutional rules. At the first association meeting of the fall, the internal auditor will present an internal audit report which should contain information about whether the board has followed the constitutional rules or not during the year, and also give a recommendation as to whether the board should be discharged from liabilities or not.